Travis Green, a former assistant GM and assistant coach with the Portland Winterhawks, is headed to the AHL All-Star Game. Green, who is in his second season as head coach of the Utica Comets, will be one of two Western Conference coaches. . . . Utica leads the conference with a 20-5-5-0 record. . . . There’s more right here. Garry Davidson, the general manager of the Everett Silvertips, has told Nick Patterson of the Everett Herald that he tried to land D Josh Morrissey before the Prince Albert Raiders dealt him to the Kelowna Rockets. Davidson also said that he continues to shop, but . . .
“Between now and Jan. 10 I’d still like to strengthen the team in certain positions,” Davidson told Patterson. “But the market looks really foggy right now, there’s not a lot of teams selling. The Red Deer Rebels have acquired D Colton Bobyk, 18, and a 2016 fourth-round bantam draft pick from the Spokane Chiefs for D Nick Charif, 19, a second-round pick in the 2015 bantam draft and a conditional sixth-round selection in 2016. . . . Bobyk has played only eight games this season thanks to injuries. From Red Deer, he has been medically cleared to return. This season, he has a goal and three assists in those eight games. Last season, he had 12 points, including five goals, in 56 games. He was a 10th-round pick by the Chiefs in the 2011 draft. . . . 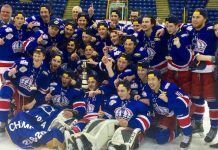 In 2012-13, Bobyk played for the Red Deer Optimist Chiefs, who won the TELUS Cup as national midget champions. . . . Charif, from Edmonton, also has been out with an injury but has been cleared to play after missing 24 games. Last season, he had 13 points, three of them goals, in 57 games. This season, he has a goal and seven assists in 11 games. . . . The Chiefs now hold two first- and two second-round picks in the 2015 draft. The Swift Current Broncos added D Griffin Foulk, 19, on Saturday, acquiring him from the Lethbridge Hurricanes for a conditional eighth-round pick in the 2016 bantam draft. . . . The Hurricanes had released Foulk from their roster earlier in the month. . . . Foulk, from Broomfield, Colo., had 23 points, including six goals, in 153 regular-season games split between the Everett Silvertips, Seattle Thunderbirds and Lethbridge. . . . He had been an eighth-round pick by the Edmonton Oil Kings in the 2010 bantam draft. . . . The Broncos were looking for some back-end help with D Dillon Heatherington playing for Team Canada at the World Junior Championship. The Broncos also are without D Jordan Harris (undisclosed injury). . . . Foulk was in Swift Current’s lineup last night as they beat the visiting Regina Pats, 5-3. At Swift Current, the Broncos erased a 2-0 first-period deficit and went on to beat the Regina Pats, 5-3. . . . F Adam Brooks, with his 14th, and F Connor Gay, with his 16th, gave Regina a 2-0 lead. . . . Broncos F Colby Cave tied it with two goals, giving him 17, at 17:41 of the first and 4:20 of the second. . . . Swift Current F Carter Rigby broke the tie, with his 13th, at 14:46, and F Jake DeBrusk got his 18th at 16:35. . . . Rigby also had three assists and DeBrusk had two. . . . Broncos G Landon Bow stopped 40 shots. . . . The Broncos (18-14-4), who visit Regina tonight, have won two in a row. . . . The Pats (20-12-2) had points in their previous three games (2-0-1). . . . Regina D Colby Williams (wrist) was back in the lineup after missing seven games. . . .
At Moose Jaw, G Jordan Papirny stopped 29 shots to help the Brandon Wheat Kings to a 3-0 victory over the Warriors. . . . Papirny has 22 victories and three shutouts this season. It was his fourth career shutout. . . . Brandon F Reid Duke got the game’s first goal, his 11th, at 9:57 of the first on the PP. . . . Duke also drew an assist on F John Quenneville’s 13th goal, an empty-netter at 18:30 of the third. . . . Brandon F Peter Quenneville had two assists. . . . The Wheat Kings (25-7-4) have points in six straight (4-0-2). . . . The Warriors (15-18-3) have lost four in a row. . . . Brandon F Jayce Hawryluk scored his 14th goal. He missed the last three games prior to the Christmas break with an undisclosed injury. . . . Brandon F Jesse Gabrielle was ill and didn’t practice on Friday. He wasn’t dressed for this one. D Kale Clague (undisclosed injury) also was among Brandon’s scratches. . . . Moose Jaw F Jaimen Yakubowski sat out a one-game WHL suspension. . . . Moose Jaw F Noah Gregor missed his 26th straight game with an undisclosed injury, while F Ben Duperreault (14 games, undisclosed injury) was back in the lineup. . . . However, F Tanner Jeannot is out for a couple of months with an undisclosed injury and D Tyler Brown (hand) will sit for up to four more weeks. . . . The teams meet again today, this time in Brandon. . . . Rob Henderson of the Brandon Sun has a game story right here. . . .
At Prince Albert, F Nikita Soshnin broke a 3-3 tie at 10:00 of the third period and the Saskatoon Blades went on to a 6-3 victory over the Raiders. . . . Soshnin, who also had two assists, has five goals this season. . . . Blades F Ryan Graham added two empty-netters, giving him 12 goals this season. . . . F Sam McKechnie had two goals, giving him 10, and an assist for Saskatoon (8-25-3), which snapped an 11-game skid (0-9-2). . . . F Reid Gardiner and F Jayden Hart each scored his 18th goal for the Raiders (16-19-1). . . . The rematch goes this afternoon in Saskatoon. . . . Saskatoon F Wyatt Sloboshan (broken jaw) was back after missing 23 games, while F Nick Zajac returned after a three-game absence with an undisclosed injury. . . . The Raiders were without D Mackenze Stewart, who served a one-game WHL suspension. . . .
At Edmonton, F Wyatt Johnson scored two second-period goals to lead the Red Deer Rebels to a 3-2 victory over the Oil Kings. . . . Johnson, who has 17 goals, gave the Rebels a 2-1 lead 32 seconds into the period. . . . Edmonton F Brett Pollock tied it, with his 14th, at 4:10. . . . Johnson broke the tie at 15:24. . . . Red Deer F Brooks Maxwell had two assists. . . . Rebels G Rylan Toth stopped 30 shots, four more than Edmonton’s Tristan Jarry. . . . The Rebels (19-13-4), who entertain the Oil Kings today, had lost their previous two games. . . . The Oil Kings are 16-15-5. . . . This was the first meeting of the season between these teams. . . . The Rebels had F Adam Musil back after a three-game absence with an undisclosed injury. . . .
At Cranbrook, G Wyatt Hoflin stopped a career-high 49 shots and F Levi Cable scored four times as the Kootenay Ice dropped the Calgary Hitmen, 6-2. . . . Hoflin was making his 24th straight start. . . . A note from Taylor Rocca of the Cranbrook Daily Townsman: “Should he get the start Sunday afternoon, Hoflin will tie the Kootenay Ice franchise record for consecutive appearances by a goaltender. Todd Mathews set the record with 25 consecutive appearances in net from Jan. 21 to March 14, 2009.” . . . Cable, who has 15 goals, scored the game’s first three goals and added a fourth in the second period to give his side a 5-0 lead. . . . It was Cable’s first regular-season hat trick. . . . Cable also added an assist for his first five-point outing. . . . Ice F Jaedon Descheneau scored his 19th goal. . . . The Ice (19-17-0) has won four in a row. . . . The Hitmen (19-13-3) has lost two straight. . . . The teams meet this afternoon in Calgary. . . . The Ice, which is missing three defencemen, has added D Tanner Lishchynsky, 19, for the next five games. He plays for the SJHL’s Flin Flon Bombers and has played 78 WHL games with the Prince George Cougars. . . . The Ice is without D Tanner Faith and D Dylan Overdyk, both of whom are injured, and D Rinat Valiev, who is with Russia at the World Junior Championship. . . . Calgary D Ben Thomas returned after missing nine games with an undisclosed injury. . . . According to Jeff Hollick, the radio voice of the Ice, Cable is the eighth player in Ice franchise history to enjoy a four-goal game. . . . Taylor Rocca’s game story is right here. At Lethbridge, F Zane Jones broke a 5-5 tie at 17:36 of the third period and the Hurricanes held on for a 6-5 victory over the Medicine Hat Tigers. . . . Jones scored twice in this one, giving him 17. He also had an assist. . . . Lethbridge also got two goals from F Jamal Watson, who has 15. . . . The Hurricanes took a 4-2 lead into the third period, only to have the Tigers tie it on two goals by F Alex Mowbray, who has six. . . . Watson gave Lethbridge the lead on a PP at 12:00, only to have D Kyle Becker pull the Tigers even at 5-5 with a PP goal at 16:59. . . . Lethbridge G Stuart Skinner stopped 42 shots. . . . The Hurricanes (9-20-5) are on a three-game winning streak. . . . The Tigers (24-9-2), who remain without F Chad Butcher (undisclosed injury), had won their previous two games. . . . There’s a rematch tonight in Medicine Hat. . . .
At Kelowna, F Rourke Chartier, the WHL’s leading goal scorer, hit for two more as the Rockets beat the Kamloops Blazers, 4-2. . . . Chartier has 34 goals. . . . He broke a 2-2 tie 52 seconds into the third period with his second goal of the game. It turned out to be his ninth game-winner this season. . . . Kelowna F Tyson Baillie scored his 24th goal, while F Cole Linaker had two assists. . . . F Cole Ully scored his 17th goal for the Blazers (13-21-5), who have lost three in a row. . . . The Rockets (29-5-3), who have won 13 straight games with the Blazers, have won three straight. . . . This game started a stretch in which the Rockets will play nine of 11 games at home. . . .
At Victoria, the Prince George Cougars built up a 4-1 lead and hung on for a 4-3 victory over the Royals. . . . F Zach Pochiro scored twice for the visitors, giving him seven this season. His second of the game, at 16:25 of the second, on a PP, stood up as the winner. . . . F Tyler Soy scored twice for the Royals, giving him 12 in his sophomore season. However, he came up short on a second-period penalty shot. . . . D Tate Olson had two assists for the visitors. . . . Prince George outshot its hosts, 30-19. . . . The Cougars (18-18-0) had lost their previous three games. . . . The Royals ((17-18-3) have lost five straight (0-4-1). . . . They’ll play again this afternoon in Victoria. . . .
At Kent, Wash., the Seattle Thunderbirds beat the Portland Winterhawks 4-3 in a game that featured six first-period goals. . . . The Thunderbirds got out to a 3-1 lead and the Winterhawks never were able to catch up. . . . F Ryan Gropp’s 15th goal, at 19:53 of the first, proved to be the winner. . . . He also had an assist. . . . Seattle D Jerret Smith scored his third goal of the season and added an assist. . . . F Paul Bittner got his 14th goal for the Winterhawks. He also added an assist, while F Alex Schoenborn drew two assists. . . . Portland was 2-for-3 on the PP; Seattle was 0-for-5. . . . 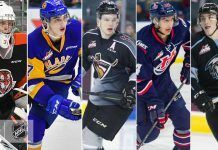 The Thunderbirds (15-15-4) have won two in a row. . . . Portland (19-15-3) had won its previous two games. . . . F Cody Glass, Portland’s first-round pick in the 2014 bantam draft, made his WHL debut. . . . The Winterhawks are at home to Spokane today. . . . The Thunderbirds are in Vancouver this afternoon. . . .
At Everett, F Nikita Scherbak scored on a PP 28 seconds into OT to give the Silvertips a 1-0 victory over the Vancouver Giants. . . . Scherbak has 16 goals this season. . . . Everett G Austin Lotz stopped 28 shots in posting his second shutout this season. He has eight career shutouts. . . . Vancouver G Cody Porter turned aside 21 shots in making his third straight start. . . . Everett had a 13-5 edge in shots in the first period; Vancouver had the edge, 12-2, in the second. . . . The Silvertips (21-9-4) have won two in a row. . . . The Giants (16-18-1) had a seven-game winning streak end. They had been 6-0-0 under head coach Claude Noel. . . . D Ben Betker (concussion) was back in Everett’s lineup. The Silvertips still are without F Logan Aasman and D Tristen Pfeifer, both out with undisclosed injuries. . . . The Silvertips also sent F Nik Malenica to the junior B Nanaimo Buccaneers of the Vancouver Island Junior League. He was pointless in 11 games with Everett. . . . The Silvertips visit the Tri-City Americans tonight. . . . The Giants, who had F Jackson Houck (undisclosed injury) back in the lineup, are at home to Seattle this afternoon. . . .
At Spokane, F Kailer Yamamoto had a goal and two assists to lead the Chiefs to a 5-1 victory over the Tri-City Americans. . . . He’s got 10 goals. . . . The Chiefs scored the game’s first five goals. . . . Spokane scored two shorthanded goals — by F Calder Brooks and F Liam Stewart — and got a PP goal from Yamamoto. . . . Spokane outshot Tri-City, 35-19. . . . Spokane leads the season series, 4-1-0. . . . The Chiefs (19-12-3), who visit Portland today, have won five straight. . . . The Americans (17-16-1) have lost three in a row. Tri-City plays host to Everett tonight.